In December 2014, the Architect of the Capitol (AOC) began replacing the roof and 180 skylights and upgrading the fall protection system on the Hart Senate Office Building. The roof and skylights, which were installed in 1982, had reached the end of their useful life and, over time, had allowed water infiltration which caused building damage. 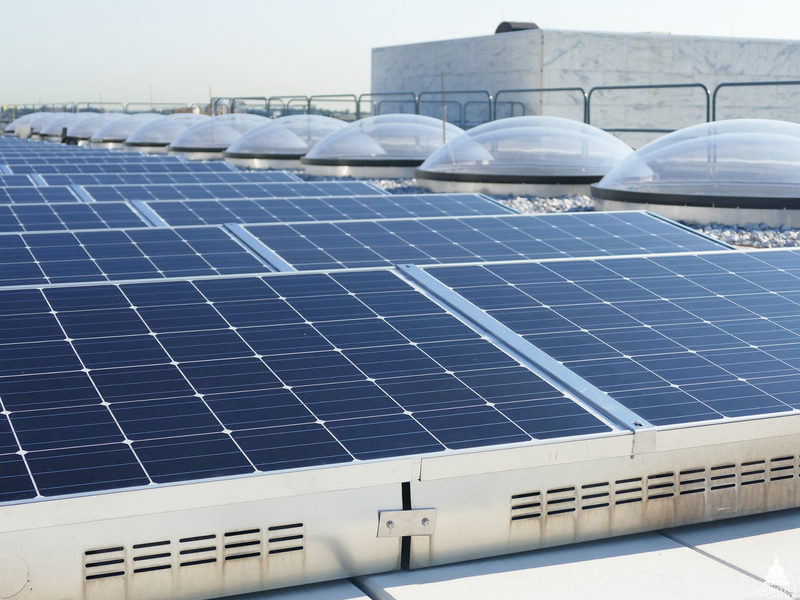 As part of the project, the AOC also installed a 148 kW photovoltaic system on the Hart roof. The solar panels will decrease utility use, increase sustainability and make the Senate Office Buildings eligible for an energy credit program which will further reduce electrical costs. The Architect of the Capitol was also able to take advantage of the suspended work platform constructed for the project to perform a structural safety analysis of the cloud components of Alexander Calder’s Mountains and Clouds sculpture in the Hart Atrium. This roof and skylight replacement was completed in summer 2015.